While Uncharted is an amazing experience overall, the game that I think currently makes the most of the Vita's features is Bigbig's Little Deviants. The motion control sensors and the rear facing camera come together in a neat series of alternate-reality games where the world around you becomes the game level. It's a fun, twisted sort of experience that works beautifully in a handheld format, particularly after seeing a similar, more static approach in Happy Action Theater for the Kinect. The multi-touch screens are also used for a number of different mini-games. You might be using the rear pad to deform the land as you roll a ball towards a goal. Or you might use the front and rear pads simultaneously in a sort of whack-a-mole game where certain targets can only be hit from the front or the rear. The only real problem with this format is that the device is so big that young gamers or those with small hands might not be able to tackle some of the tougher challenges. As inventive as some of the Vita titles are, there are some straight ports in the catalog. Rayman Origins works beautifully on the Vita, but it's already a design that's very handheld-friendly. The same is true of Lumines. 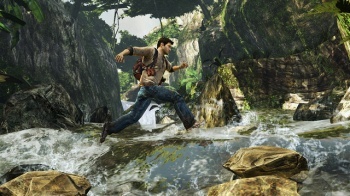 In both cases, the challenge is less to adapt the game to the controls or format, and more to get the same exact game running on a different piece of hardware. Yes, these games make use of some of the Vita's new features, but they don't really change up the experience as much games like Touch My Katamari or FIFA. Sony's portable is also considerably larger than most other handhelds, so it works better in your backpack or suitcase than in your pocket. It's not a big deal if you can slip it into a large coat pocket, but it's too bulky to fit in your pants, especially if you're going to get some sort of case or armor. I'm a little more forgiving of this inconvenience, because for me, it's a viable option for vacations or business trips. If you're looking for something with more on-the-go flexibility, you'll find the system (and the dozens of tiny game cards) are a bit cumbersome. The same is true of the system's battery life. Again, given everything that it's doing, I'm not surprised that it needs to be recharged a couple of times a week with regular use, but a handheld that won't last more than five or six hours is undeniably limiting. Verdict: The things that work against the Vita never really overshadow all the things that work for it. Most handhelds have had to offer altogether different types of experiences than you find on the traditional consoles, but the Vita takes the opposite approach, striving to take what works on the PS3 and make it work in a smaller, portable format. On that score, it succeeds beautifully. If you're looking for the games that make the most of what the Vita has to offer, you definitely want to check out both Uncharted and Little Deviants, which not only explore the full set of features available on the handheld, but are also just genuinely a lot of fun. Be sure to check back for reviews of specific titles in the coming weeks.